World Options franchisees from across the country to gather and celebrate another record breaking year. The conference opened by welcoming 15 new franchisees to the network and attendees enjoyed presentations from leading couriers UKMail and Whistl, as well as presentations from the Directors of World Options. As a special surprise, the conference was then treated to an inspirational keynote speech from World Championship and European Championship gold medallist Derek Redmond about overcoming adversity. Derek was famously carried across the finishing line by his father when he pulled his hamstring at the 1992 Olympics. A special award ceremony followed, where the Directors of World Options award their champions in business – World Options franchisees. For the first time this included presentation of the Millionaires Row accolade. The award recognises franchisees who have reached more than £1 million revenue in online shipments during the past year. This was awarded to the most successful World Options franchisee Simon Douglas from the Guildford. In Second place, reaching Millionaires row was Russ Thornton and Steve Brock from the Manchester South franchise. Franchisee Simon Douglas also won the award for being the highest’s earning franchisee over the last 12 months, making an astonishing £500k gross profit in 12 months. Simon has been a franchisee for 4 years, and each year he has grown his franchisee with consistency and determination. Stewart Butler, Group CTO and founder of World Options said: “Our Conference are always a fun affair, giving our franchisees the opportunity to come together and learn about developments within the industry, at the same time giving them the recognition for the fantastic work they deliver day-in, day-out which is to help businesses ship." "The last 12 months have been an exciting and busy time for us, we have invested in new I.T systems to help World Options franchisees become even better at what they do. And since the official opening of our offices in the USA in January 2018 we are now authorised resellers for UPS, only the second company to do this in the USA, which is a fantastic position to be in. 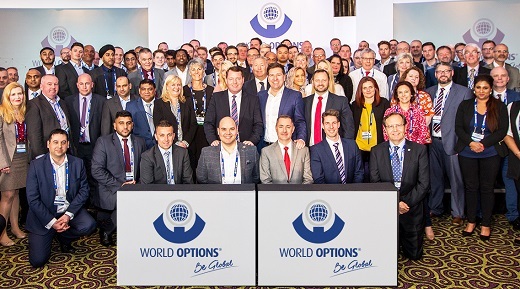 I would say there has never been a better time to join the World Options franchise, we have the best tools in place to help franchisees succeed and build a fantastic business for themselves”. In order to become a full member, a franchise organisation needs to have between 50 - 100 active franchises and must comply with high BFA standards that show the franchise is reliable and trustworthy. The process is in place to help guarantee that potential franchisees are protected from joining a franchise that may not provide a business worthy, profitable franchise opportunity. Now that World Options have over 75 active franchises in the UK, they have proved that their franchise opportunity is a highly lucrative franchise, which is well worth considering for investors looking to start a business. Warren Ferguson, World Options Franchise Director said, “We are absolutely delighted to be awarded full BFA membership. We started franchising in 2012 and in just 5 years I have seen some of our franchisees transform into really successful business owners. Their lives have changed rapidly because they decided to realise their dream of becoming a businesses owner and joined the World Options franchise”. Stewart Butler, World Options Sales Director added, “Our brand slogan is: Be Global this very much stands for who we are, what we do, how we work and our attitude towards expansion. Over the years we have built good relationships by partnering with the largest carrier companies in the world to offer the very best online shipping service. This has really opened up the possibilities for our franchisees, helping them provide their customers with more shipping options. Getting full BFA membership tells us we are doing things right for our franchise network”. 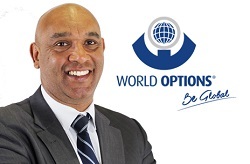 James Edwards, World Options Finance Director explains, “We work hard to maintain high standards at World Options, so to be full BFA members is really fantastic news. The beauty of the World Options franchise is, you can keep costs very low and there is no end to the earning potential. Some of our franchisees have family commitments, so they prefer to work flexible hours 3-4 days a week and make a very good living from this. Others are very driven, smashing huge targets, they put in extra hours and are earning upwards of £400k gross profit a year. It’s really down to the franchisee and what their ultimate goal is. We are pleased to have built a franchise model that is flexible and allows people to reach their business goals”. Earning nearly half a million pounds in one year might seem like a dream to some, but for Simon Douglas, it is his reality. Just three years ago he invested in starting a business by becoming a World Options franchisee and he has never looked back. As one of the highest turnovers, earning over £400k in 2016 across the World Options franchise network it is no surprise that franchisee Simon Douglas from Guildford is smiling. With a long career in courier sales under his belt Simon became a World Options franchisee in November 2014 and immediately put his experience and knowledge to work. After much research into the different franchise options available to him Simon decided that World Options was certainly the best offering and the rest as they say is history. A World Options Franchise owner assess a business’s courier or shipping requirements and offer a range of options with substantial savings by using the World Options online portal. The World Options franchise gave Simon the perfect opportunity to achieve his ambition of opening up more shipping opportunities and building a strong business with a high turnover and low overheads. With World Options you don’t need an office, you can work from home and choose flexible hours you want to work. Simon decided to go for it, he put in the hard work and it wasn’t long before the long hours and huge efforts started to pay off. Year on year Simon has increased his margin by providing the World Options online portal to business customer who need courier and shipping services at the click of a mouse. "You have to have clear expectations of what you want to achieve and then just go for it, it’s totally worth it”. Whilst the franchise offering creates a flexible lifestyle, for Simon it’s about building a business that is the biggest and best it can be. It is this passion and commitment to his business that has led to a significant growth in turnover over the past three years and Simon continues to see growth and the prospect of even further gains. In just five years World Options have expanded from zero to 75 franchises in the U.K, they have proved to be a real contender as a highly lucrative franchise business opportunity which works. Thinking of starting a business? World Options take the risk out of starting a new business by offering a product, a plan, a method and a platform for a new franchisee to work from. Find out more about this opportunity by contacting our team!